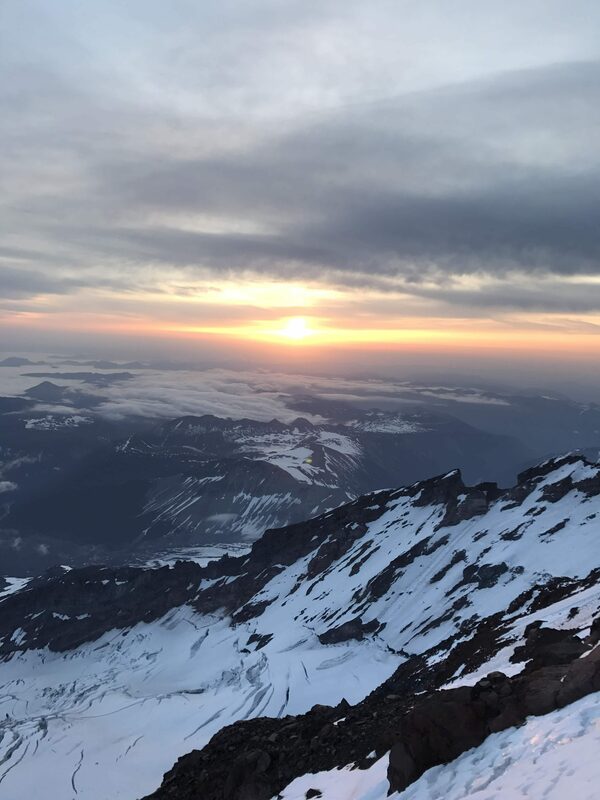 Seeing the north face of Mt Rainier is truly a sublime sight! 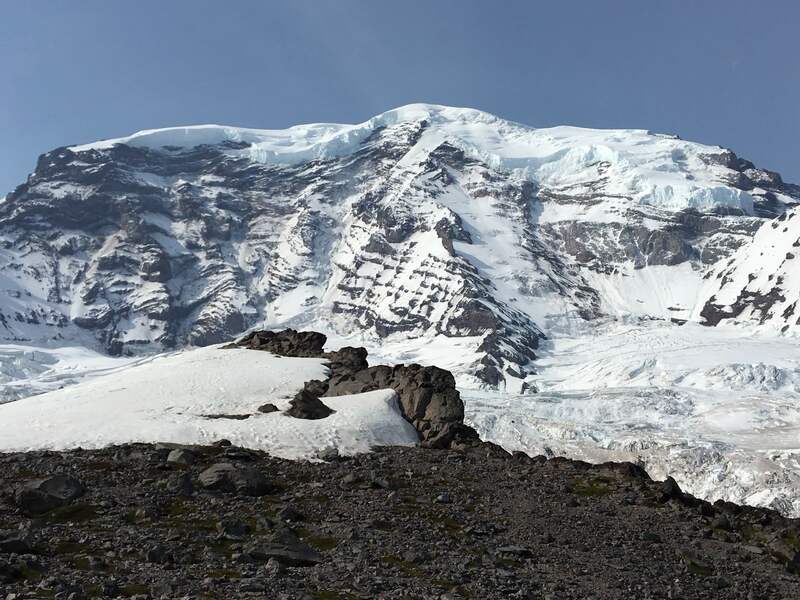 The north face of Mt Rainier rises more than 7000ft from the glacier floor. 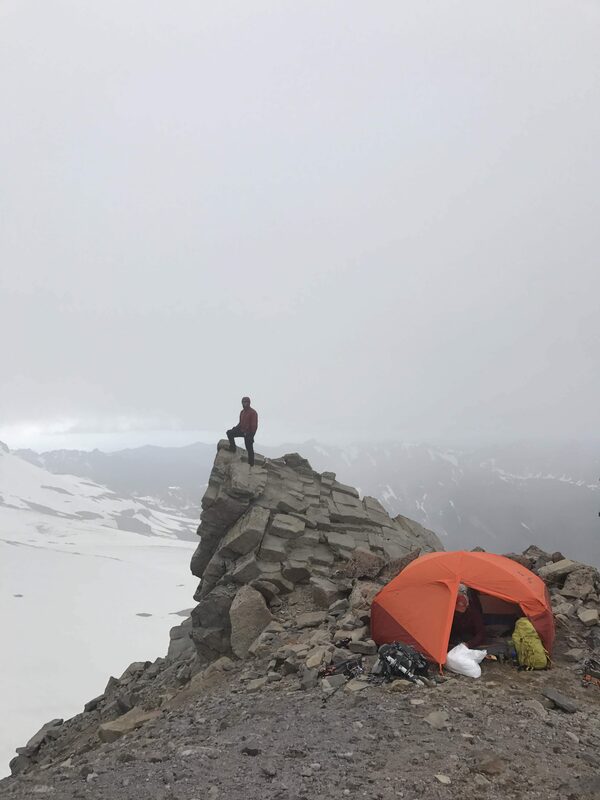 It is flanked to the left by Curtis Ridge and to the right by Ptarmigan Ridge and split right in the middle by the steep and majestic Liberty Ridge. It is here that one feels as though they have entered the halls of the mountain gods. 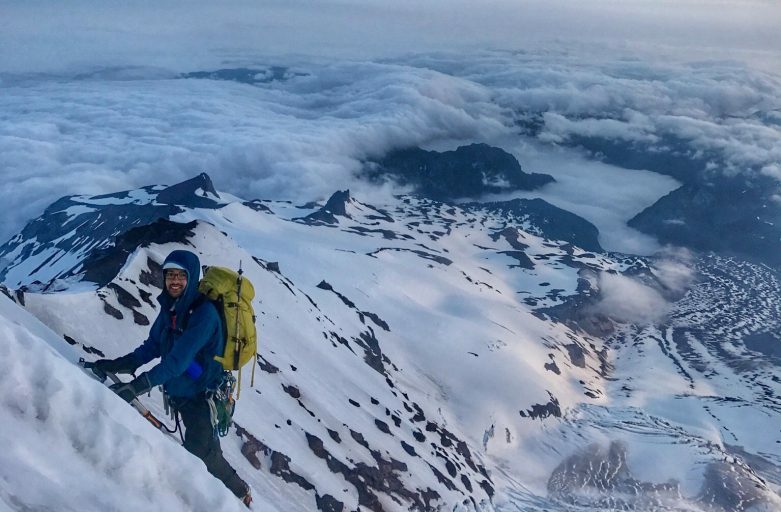 The first ascent of Liberty Ridge took place in 1935 when Ome Daiber, Will Borrow, and Arnold Campbell scaled the route in four days, traversing the mountain from north to south and finishing at Paradise. 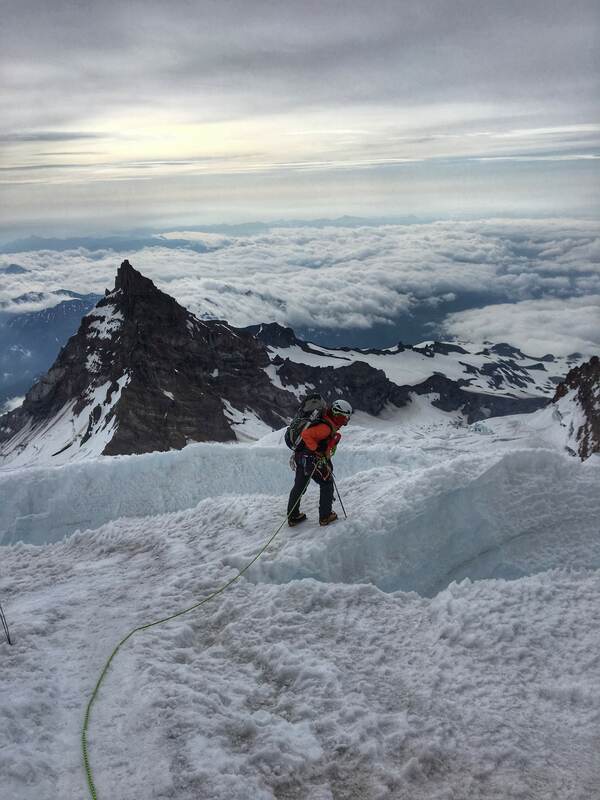 This ascent was assisted by the aerial reconnaissance conducted by legendary American mountaineer, Bradford Washburn. 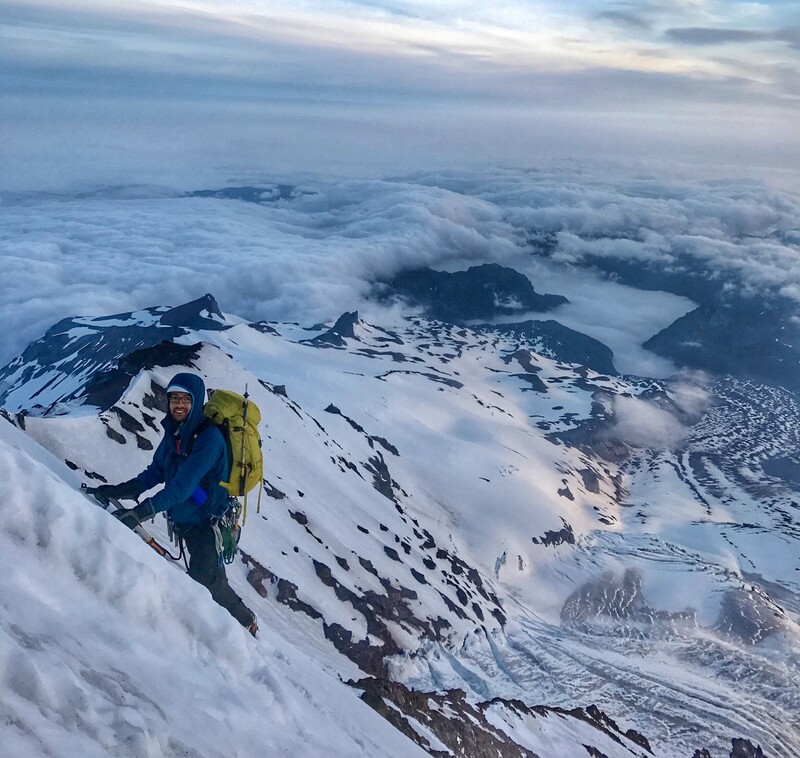 In this way, finally, the wild north face of Mt Rainier was climbed 65 years after the first ascent of the mountain. 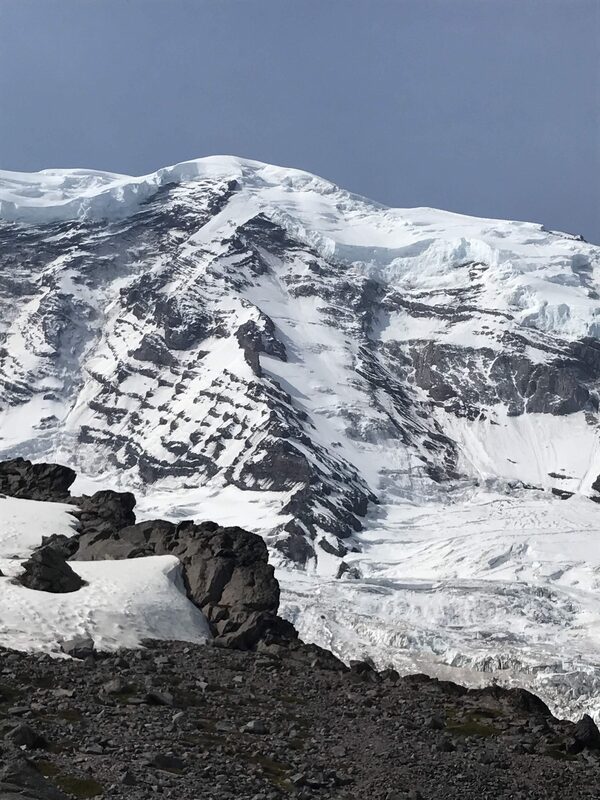 Over the years, the north face of Mt Rainier still stands as a formidable problem as compared to the rest of the mountain. 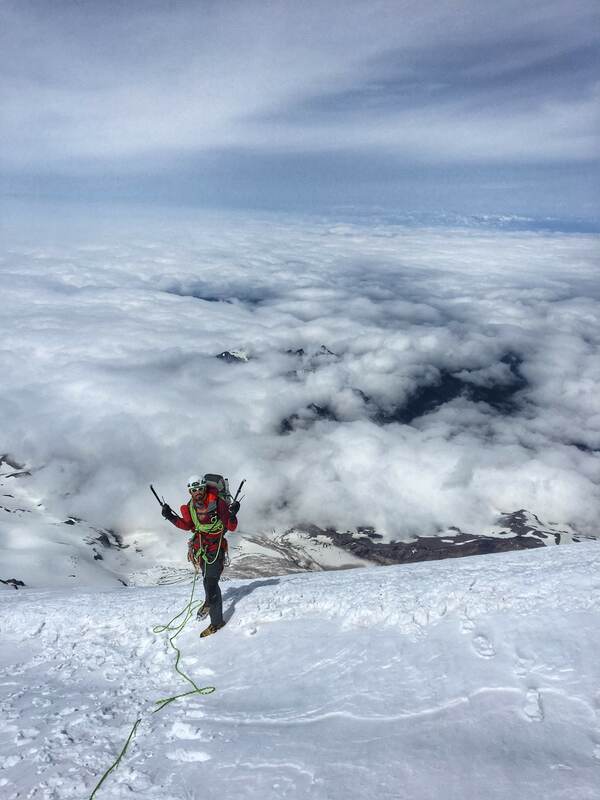 According to the National Pack services, about 10,000 climbers attempt Mt Rainier every year. Out of this, only 100 of climbers (1%) attempt via the Liberty Ridge, and the route only has a 30-60% success rate. There are several factors which lead to such a small number. Not only does it require a longer approach with more elevation gain, but it also lays over a heavy glaciated terrain. 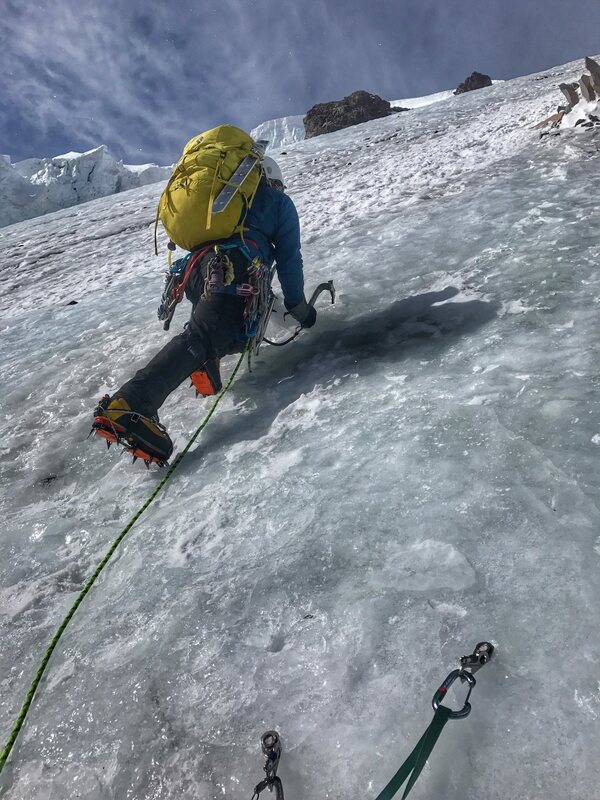 The Liberty Ridge route is also much more technical and committing in nature, requiring ice climbing at high altitude. Along with technical climbing, once you’re past a certain point, it’s very difficult to retreat. 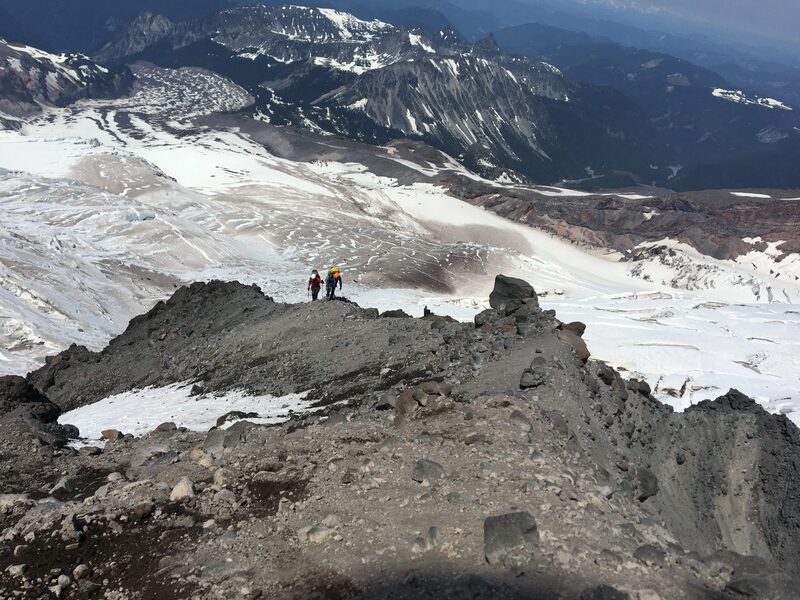 Hanging over the top of Liberty Ridge is Liberty Cap, a glacier that frequently sheds ice and leads to many avalanches in the vicinity. The rock on Mt Rainier is volcanic and chossy so there are several instances of rock fall, especially during warmer times of the day. Last, but the not least, the weather on the north side of the mountain can quickly change. A sunny, 5-10 mile hour wind day can suddenly turn into a 45-mile hour white-out day. One of the greatest climbers of all times, Don Whillans, famous for his historic first ascent of Annapurna’s South Face once said: “All I am interested in is a great line!” in his classic cracking one-liner. 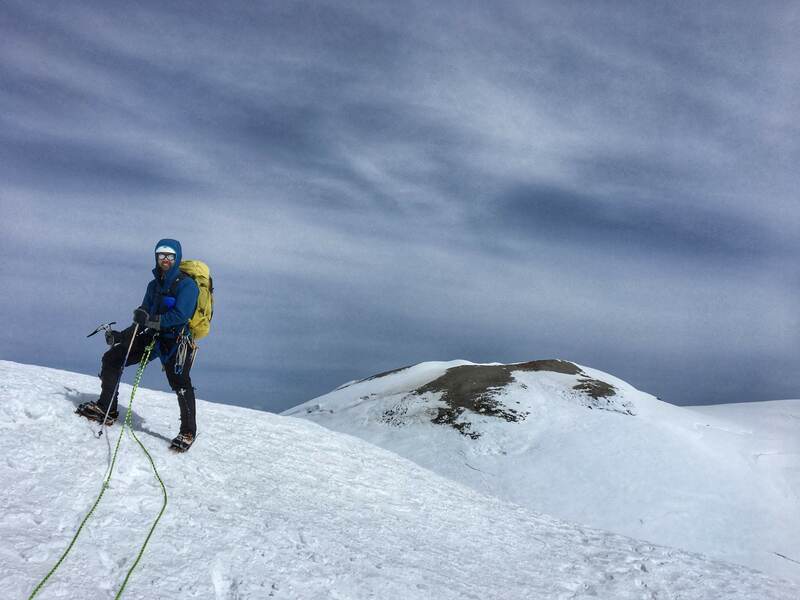 That is the reason why we chose to climb the Liberty Ridge because it is a great line. Liberty Ridge is a very aesthetic yet challenging line. 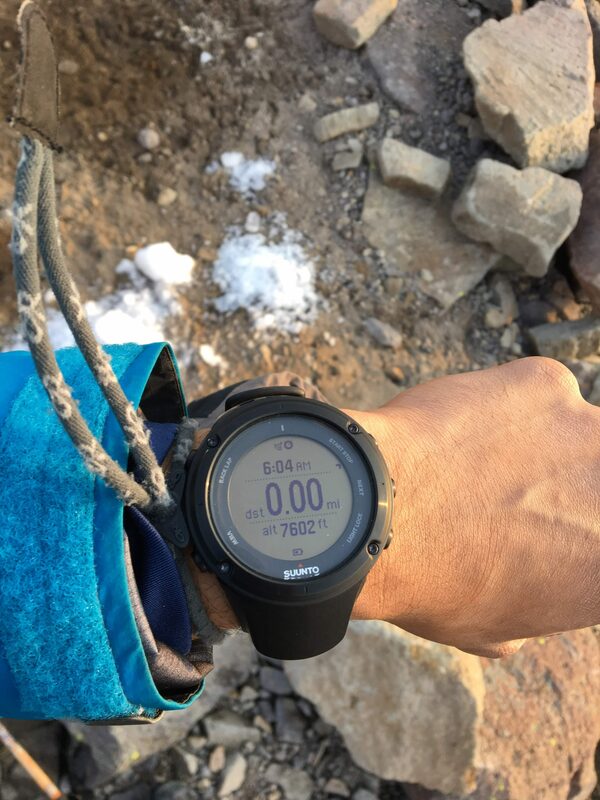 It tests the fitness, navigation skills, ice climbing, glacier travel and overall mountain sense of a climber. 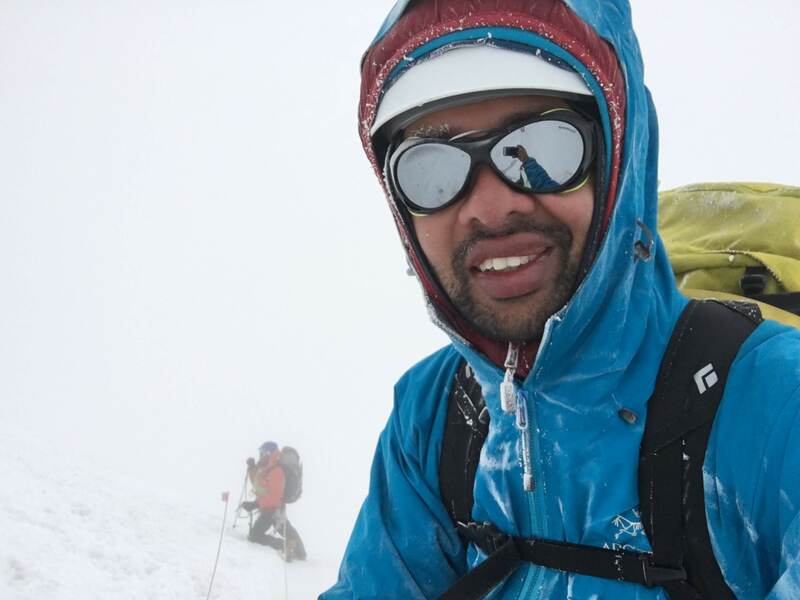 It also tests the climber’s judgment and understanding of weather systems. It’s a route that requires a climber to be proficient in various forms of climbing and be able to swiftly transition from to another. 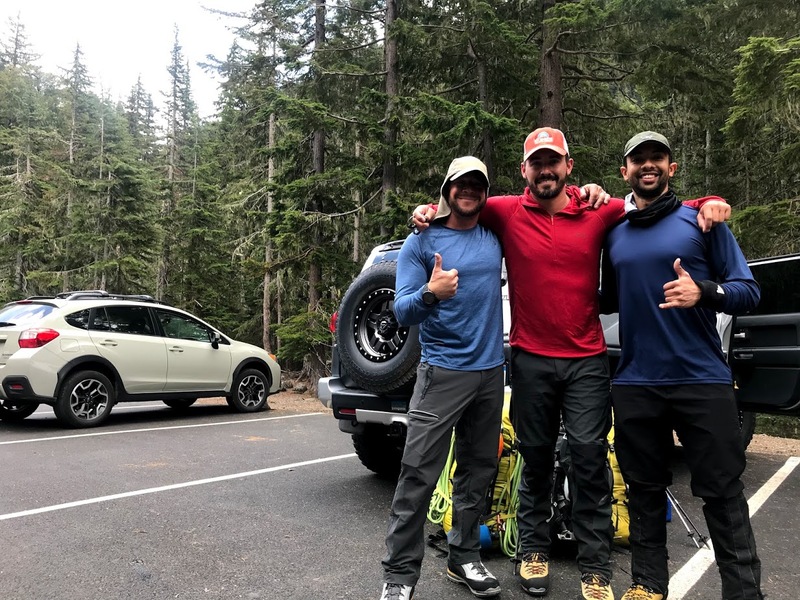 Since all three of us had spent a lot of time in the mountains and have been climbing for many years, we started working on our overall fitness. 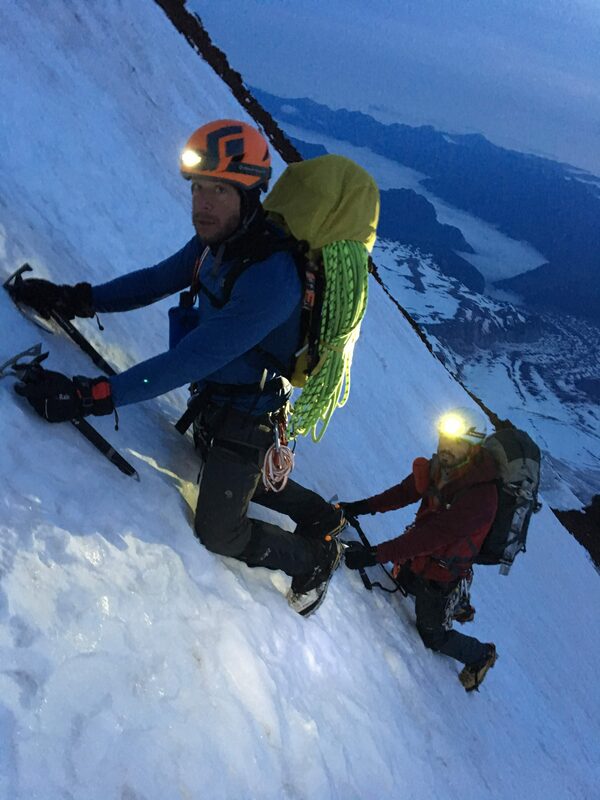 We incorporated the approach that Scott Johnston and Steve House shared in their book Training for New Alpinism. 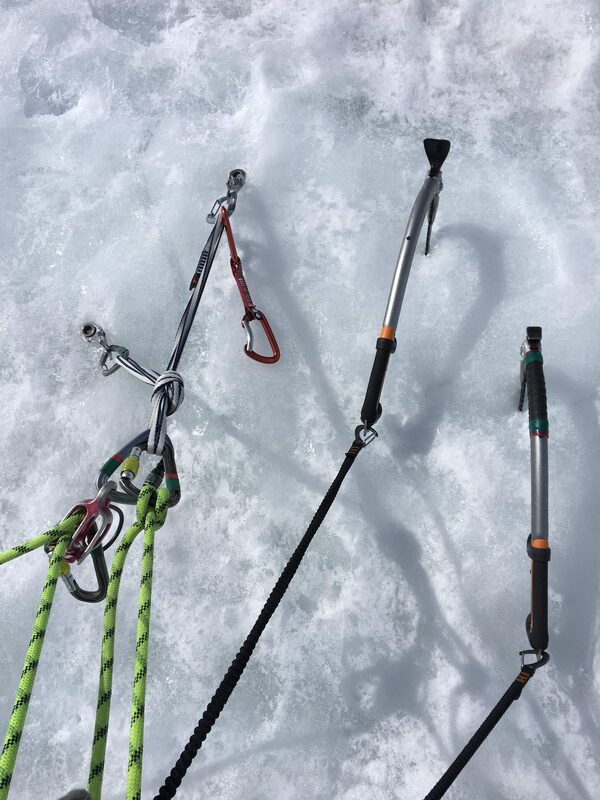 For a good understanding of ice climbing, we climbed ice in Lee Vining Canyon, California and Hyalite Canyon, Montana this past winter. Mike, who was recovering from an ACL surgery, worked incredibly hard on his knee rehab. 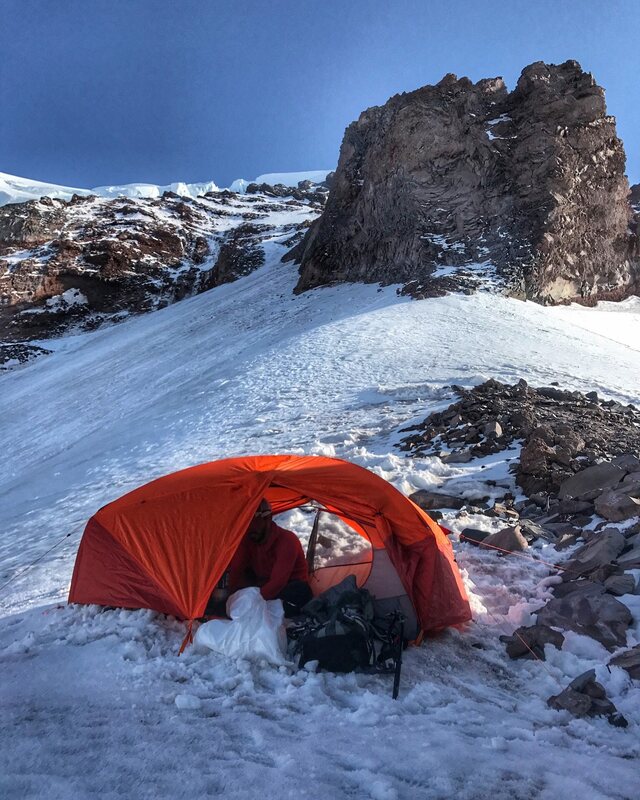 Both Mike and Ross spent multiple days on Mt Shasta (California) to train at high altitude. 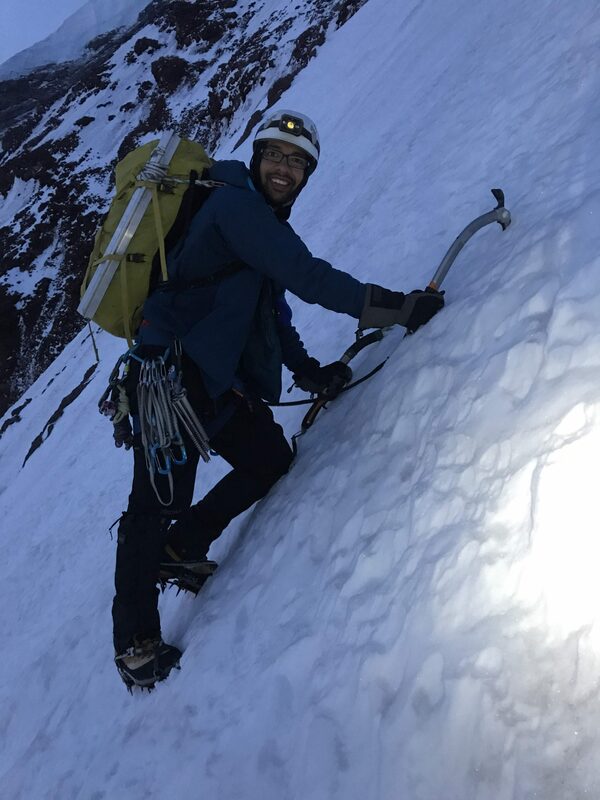 We also worked with Chris Tomer to help us understand the weather patterns on Mt Rainier and planned our climb during a good weather window. 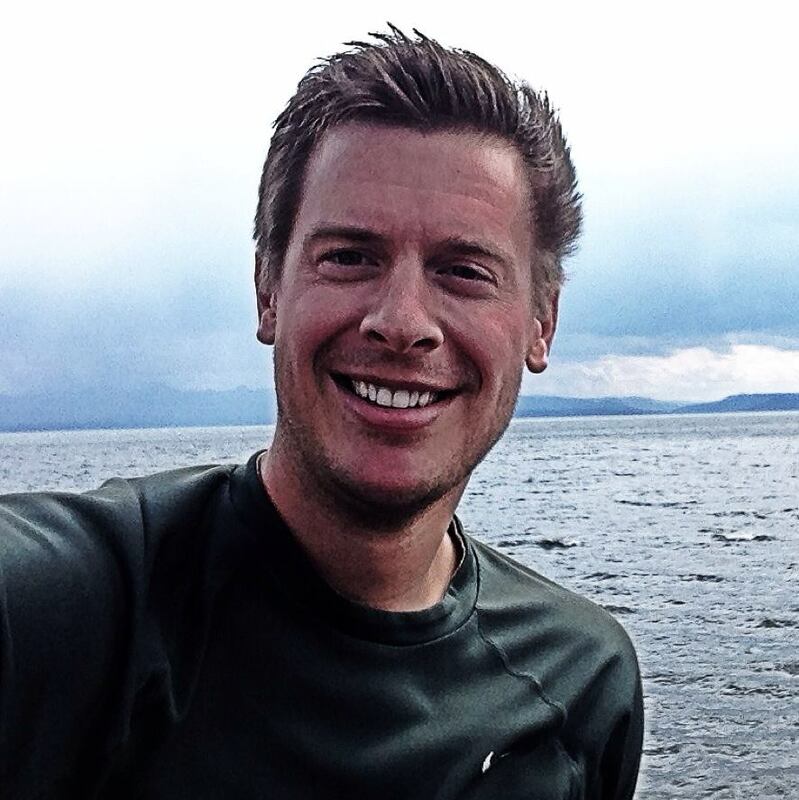 Chris is a mountain meteorologist from Denver, Colorado who has helped many teams summit mountains such as Mount Everest, K2, Gasherbrum I, Gasherbrum II, Broad Peak, Nanga Parbat by correctly predicting good weather windows. 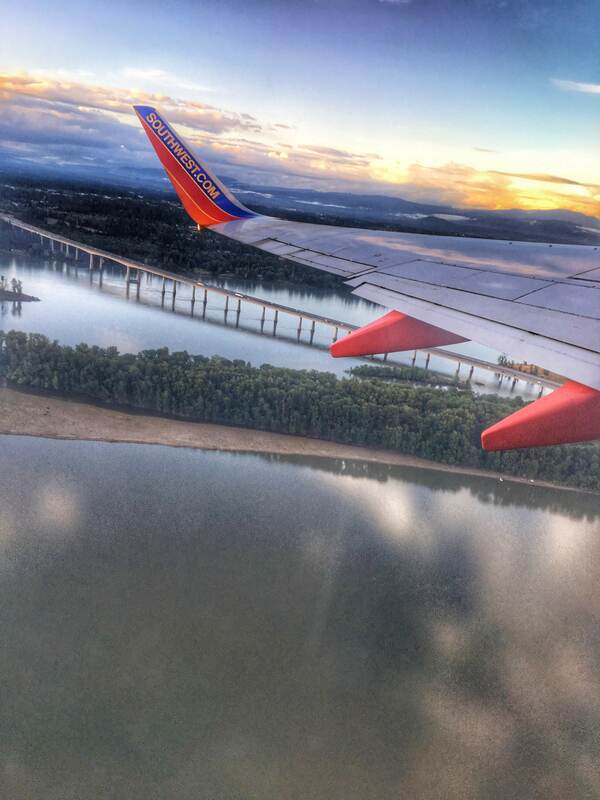 We left Portland early in the morning with 3-4 hours of driving ahead of us to get to the White River Ranger station. We picked up out permits from the Ranger Station at about 1 pm. 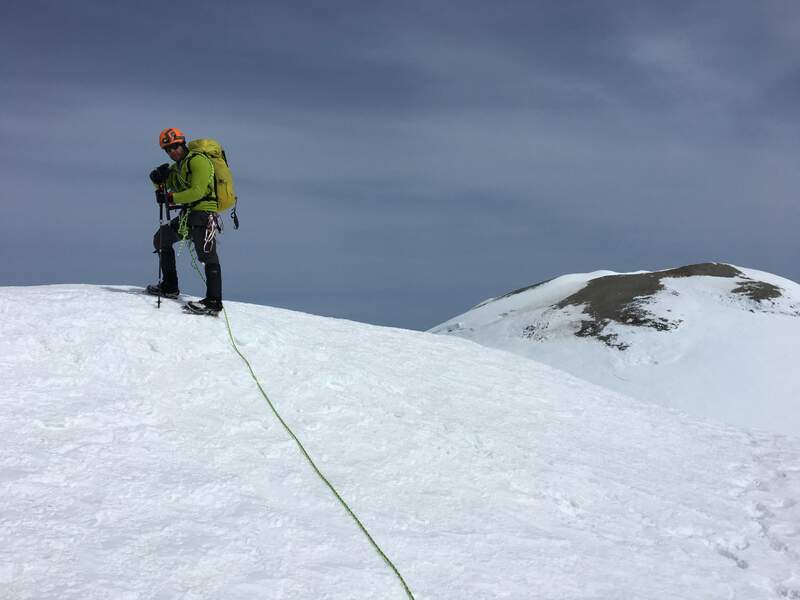 We were informed that the weather looked great with freezing levels around 10,000 ft, winds lower than 30 mile and considerably warm conditions. We were also told that there were two other parties who picked their permits a few hours before us and would be on the route with us. 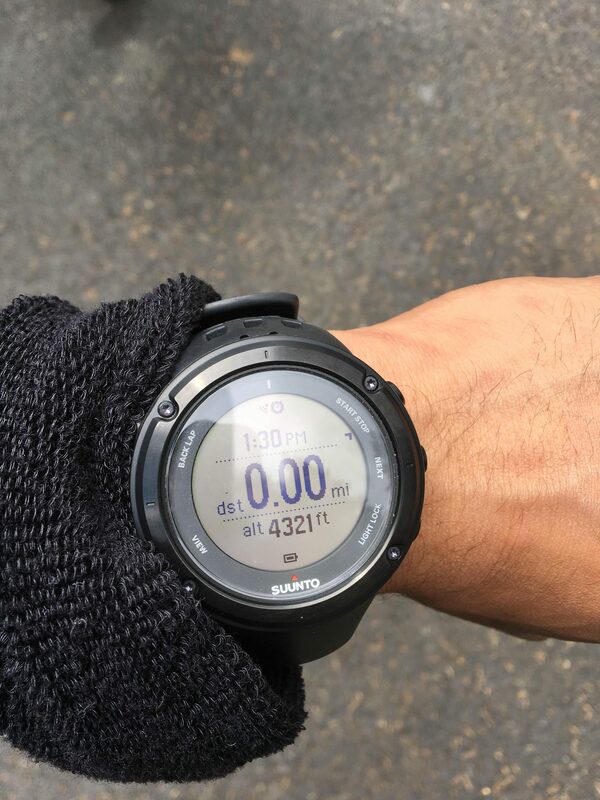 We did a final gear check and started hiking from the parking lot at about 1:30 pm. 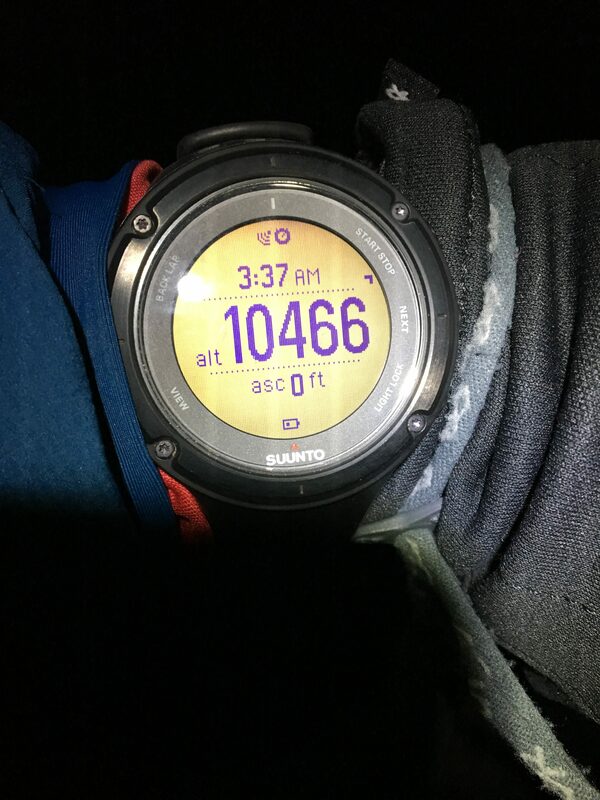 After hiking for a few hours, we reached St Elmo’s pass where we decided to call it an early day, as we were tired from the plane and car ride over. We found a really nice, flat campsite that was perched high up on the pass and protected from the wind. Incredibly, Mike and Ross still had cell phone service so they texted and FaceTimed home to inform the end of a productive day. 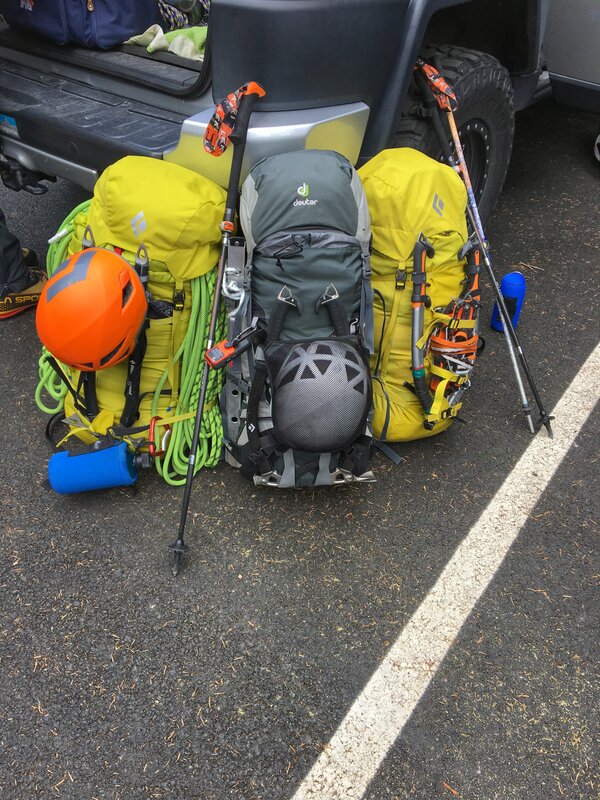 Our packs weighed an even 30 lbs with all the gear and food (for 4 days), minus the rope, which we planned on passing around between the three of us. Mike, the BEAST that he is, volunteered to carry the rope which weighed about 6 lbs! The party has started at the Glacier Basin trail! White River and Mt Rainier’s eastern side, shrouded in clouds. Dinner is served, as we called it a day! We hoped to start early on day two but ended up starting nice and easy at about 6 am. 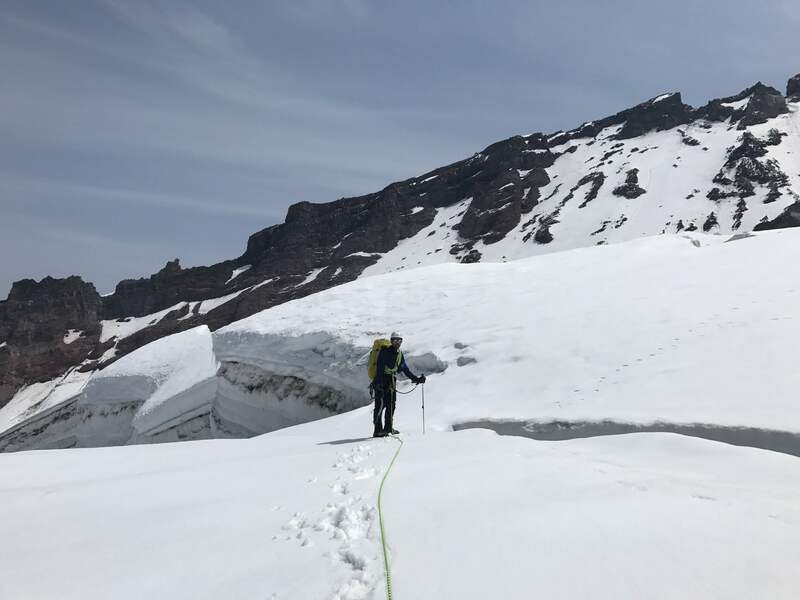 We quickly dropped down from St Elmo’s pass on to Winthrop glacier, which was in really good conditions with very few open crevasses. Looking down, I couldn’t help but notice how much the glacier had receded at lower altitude. 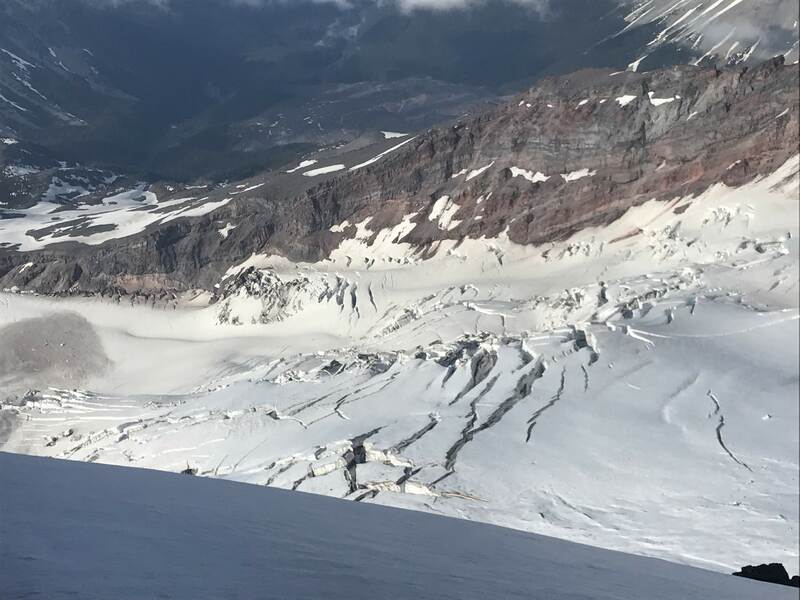 One could quite easily see the moraine plains that stretched vast into the Rainier wilderness where the Winthrop glacier would have once been. Moving on, we crossed back over on to terra firma, and in no time, were at Curtis Ridge. 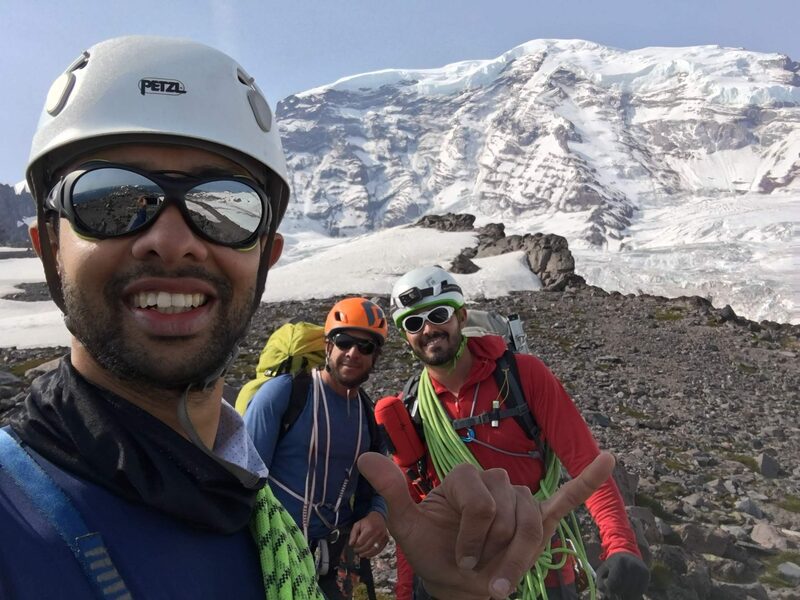 At Curtis Ridge, we ran into one of the teams with whom we were supposed to share the route. This was a guided team of three (1 guide, 2 clients). 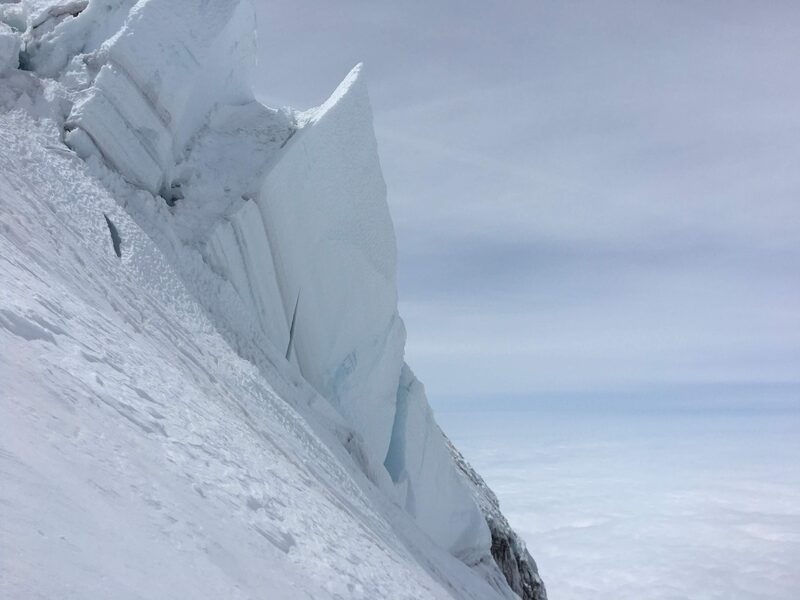 One of the clients showed us an avalanche video and told us that he had heard avalanches coming down the Willis Wall all night and had no desire to go into avalanche terrain. 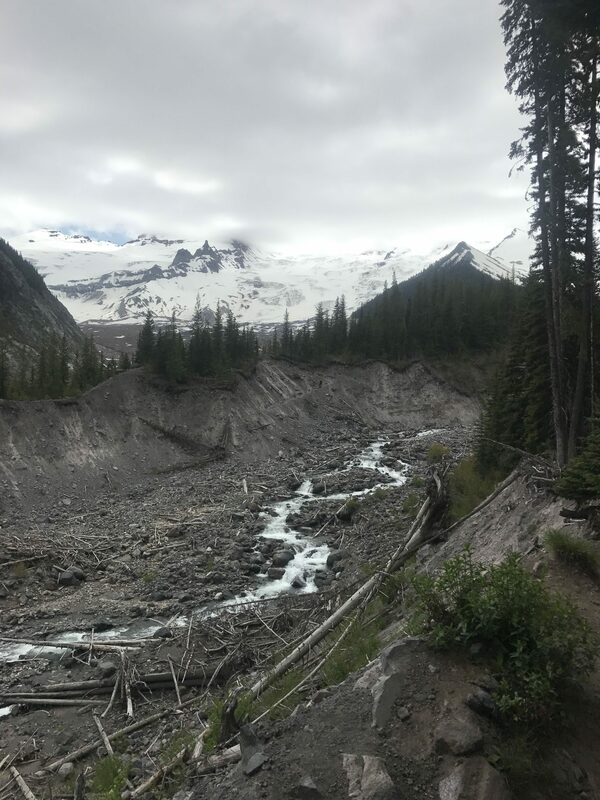 It’s very common to hear avalanches on the north face of Mt Rainier as the Liberty Cap is a hanging glacier that lets loose a lot of ice. Most of the time, these avalanches fall on to one side or the other of Liberty Ridge due to the geometrical shape of the ridge. My friend Nick Sweeney captured a good shot of one such avalanche, during his own attempt on Liberty Ridge. 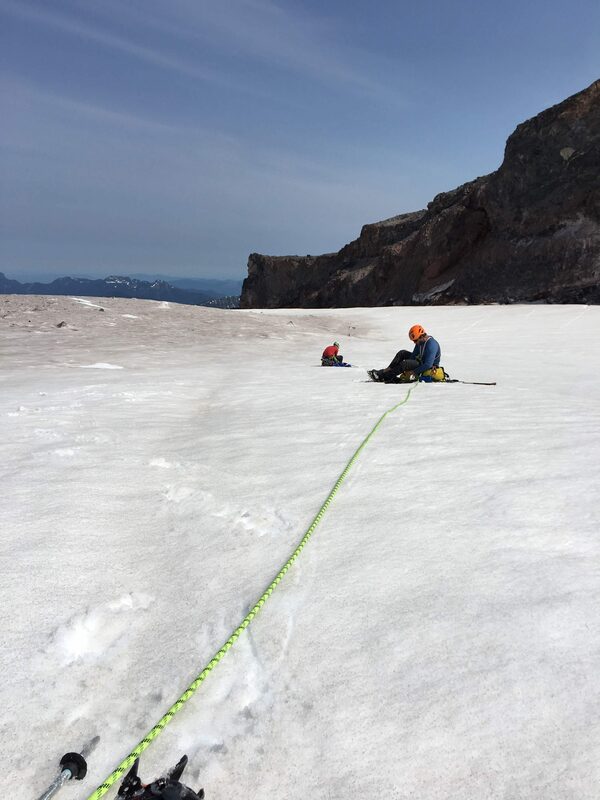 When I asked the guide why they were turning around, he assigned the reason to the difficulty of crossing the Carbon Glacier, which was in late season condition. While we were talking to the guided team, another team of two showed up. They too had decided to turn around without an obvious reason. As both of these teams turned around, we became the only humans in the halls of the mountain gods (aka the north face of Mt Rainier). 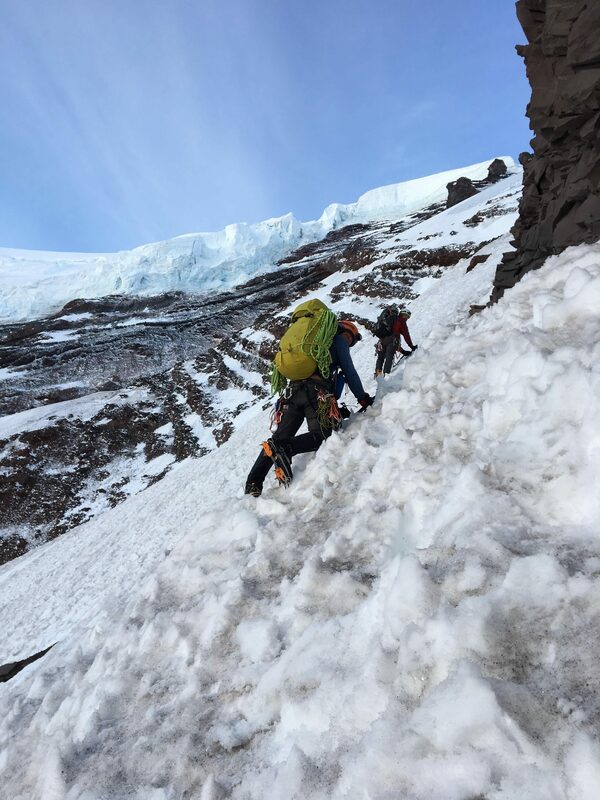 We inspected the route we’d be taking on the Carbon Glacier, talked over the options, weather conditions and decided to push on. 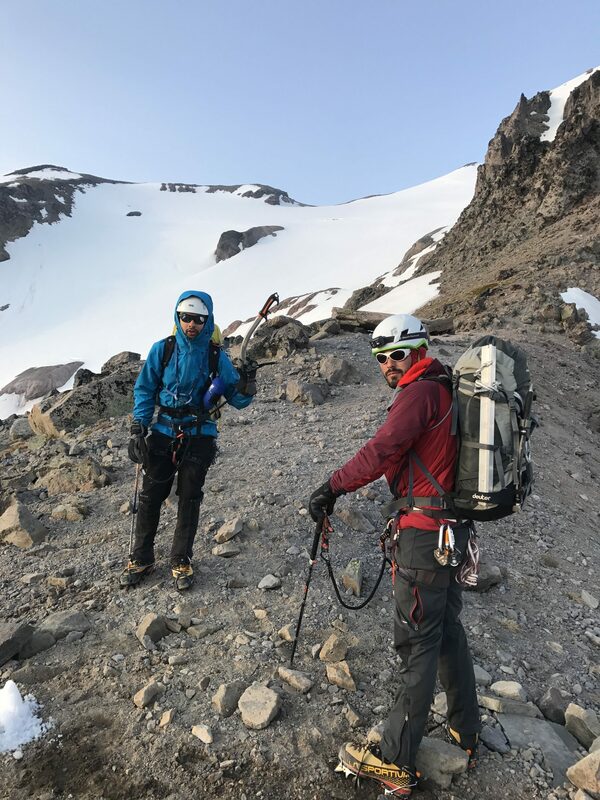 As we descended on to the Carbon Glacier, we were all excited to have Liberty Ridge, one of the Fifty Classic Climbs of North America all to ourselves. 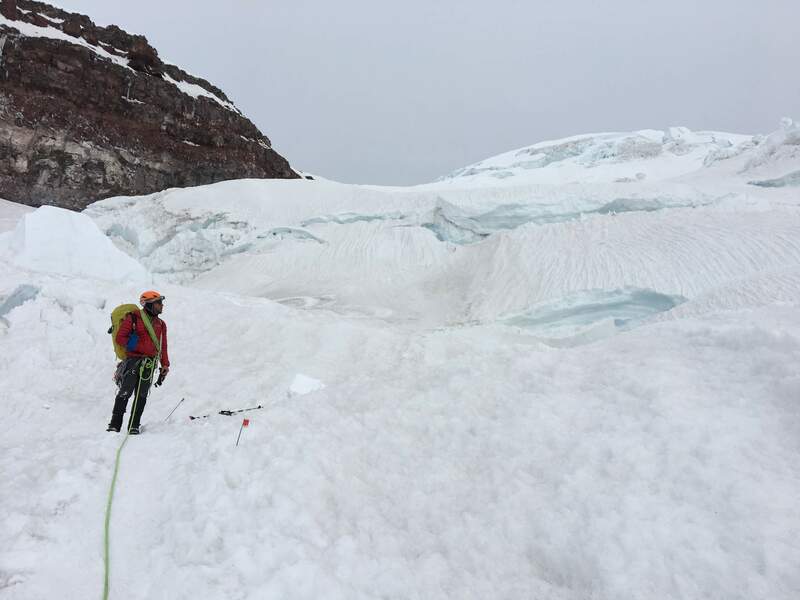 As expected, the Carbon Glacier was in late season conditions, but we were prepared and meandered our way through a minefield of crevasses and snow bridges. As we moved up, we witnessed a few avalanches coming down the Willis wall, but all of the action seemed to be pretty far away. Soon, we were at the toe of the ridge. Gaining the ridge was the sketchiest thing we did throughout the climb. Ross, in my opinion, found the sketchiest way to gain the ridge. What followed next was a harang of swear words and “rock rock rock” warnings. 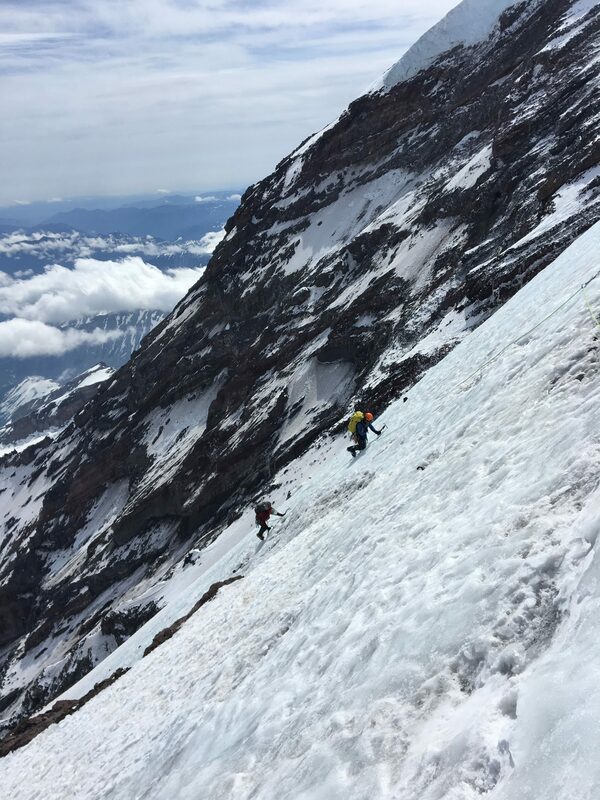 Usually, during a climb, the descent always looks easier than the ascent. However, at this point, it seemed easier to keep going up than to descend down. We started moving towards Thumb Rock and witnessed a few more avalanches; this time was on Liberty Wall. 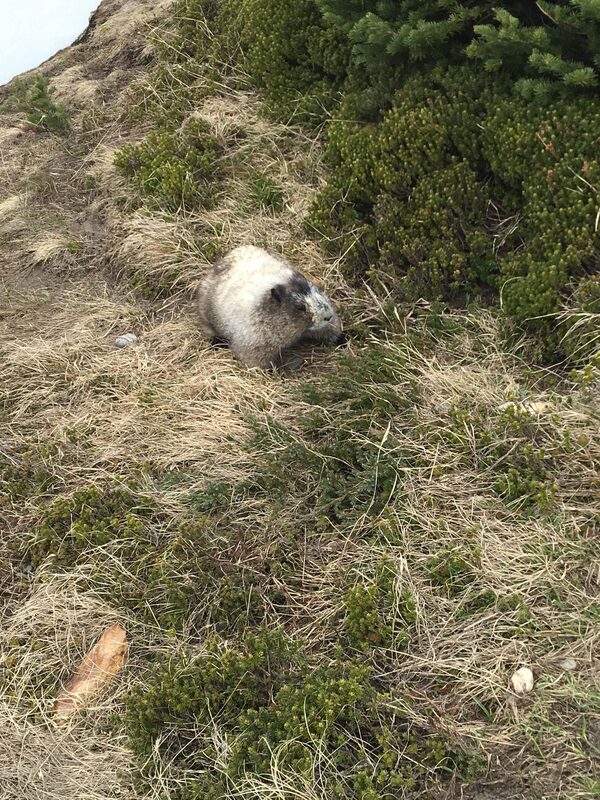 The roaring sounds of the avalanches were complemented by the gentle pitter-patter of falling rock. In another hour or so, we had made it the Thumb Rock where we set up our camp and called it a day. Ross and I at St Elmo’s pass ready for another not so “Alpine” start! 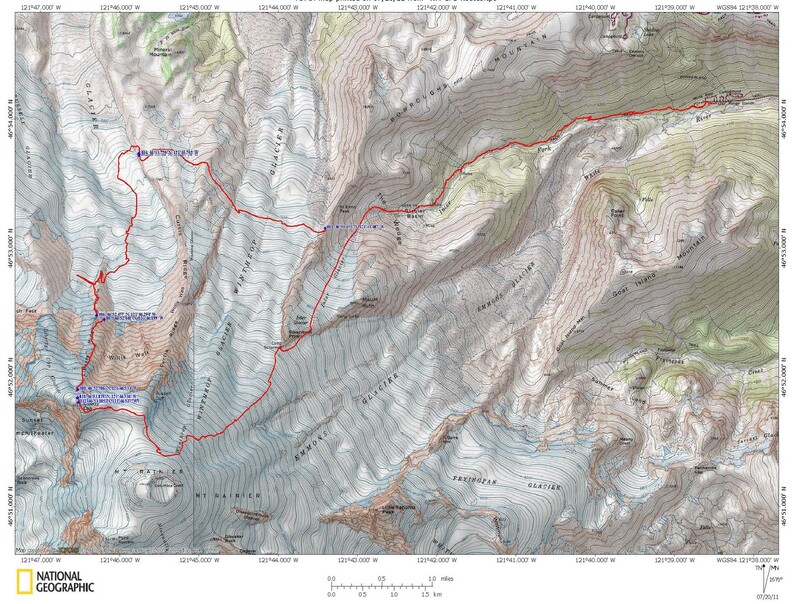 A rough outline of the route we took to climb Liberty Ridge. 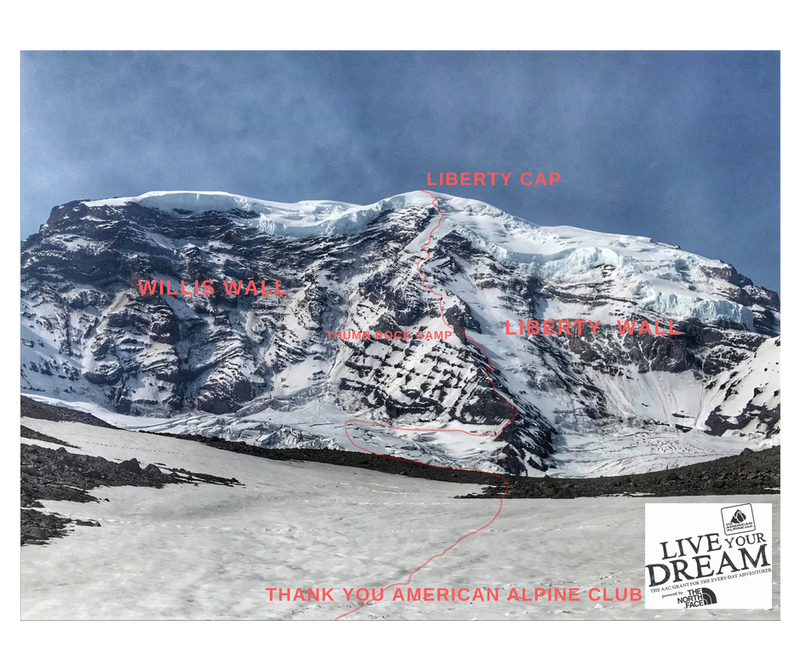 Many thanks to American Alpine Club’s Live Your Dream Grant which helped fund this climb. 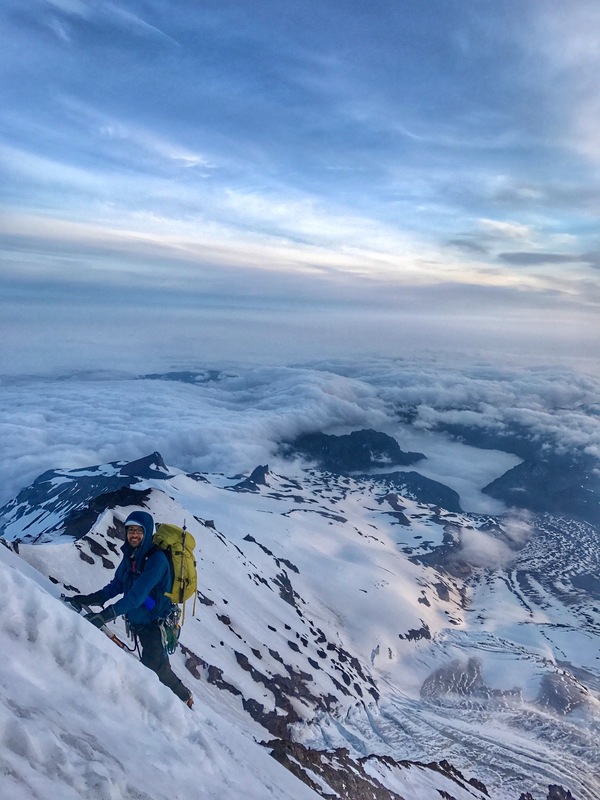 The Live Your Dream grant, powered by The North Face, is designed to help every-day adventurers take their abilities to the next level. It’s about personal progression. It’s about supporting each other; getting out there to push our individual limits; taking our skills to the next proving grounds, wherever that may be. The purpose of this grant is to support and promote unforgettable experiences for climbers—to dream big, to grow, and to inspire others. I strongly encourage you to apply! As the sun sets we call it a day at Thumb Rock camp! Summit Day! On this day, we did make somewhat of an alpine start! From Thumb Rock, we skirted left, up the firm snow and neve and made our way in the dark. 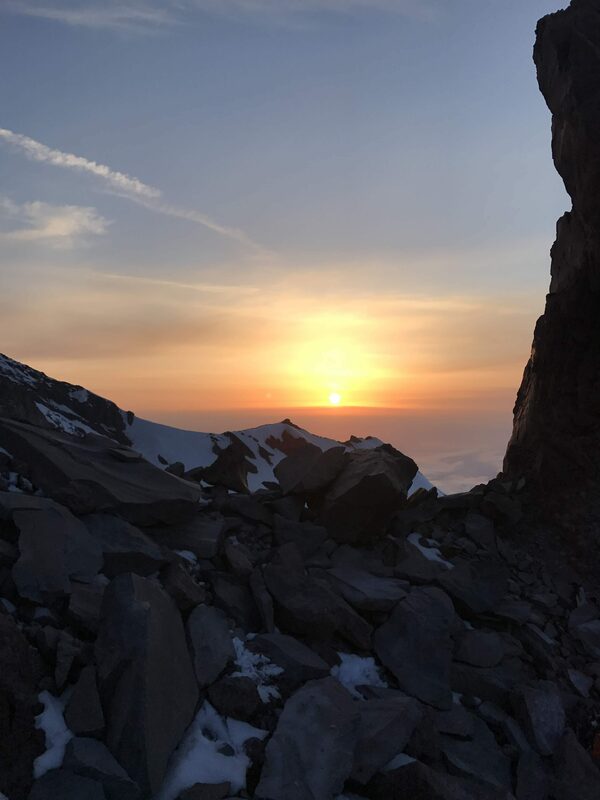 Our goal was to get to the ice before sunrise, where we could take our merry time and enjoy some ice climbing! We did a great job moving fast in the dark and weaving our way in and out of the occasional rock bands. In this way, we made it to the base of the Black Pyramid just a few minutes after the sunrise. The blue ice was in terrific shape and there was about 1,000 ft of it. 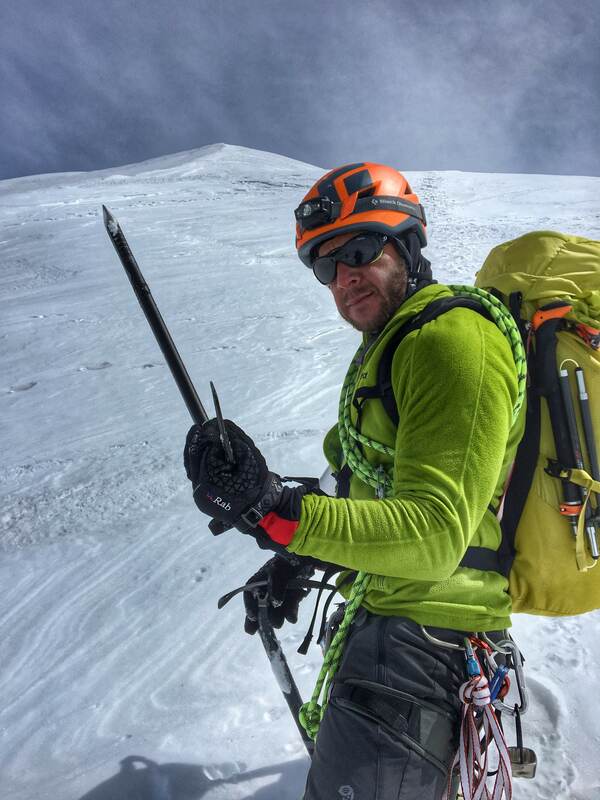 For the next few hours, we were in an alpinist’s heaven! 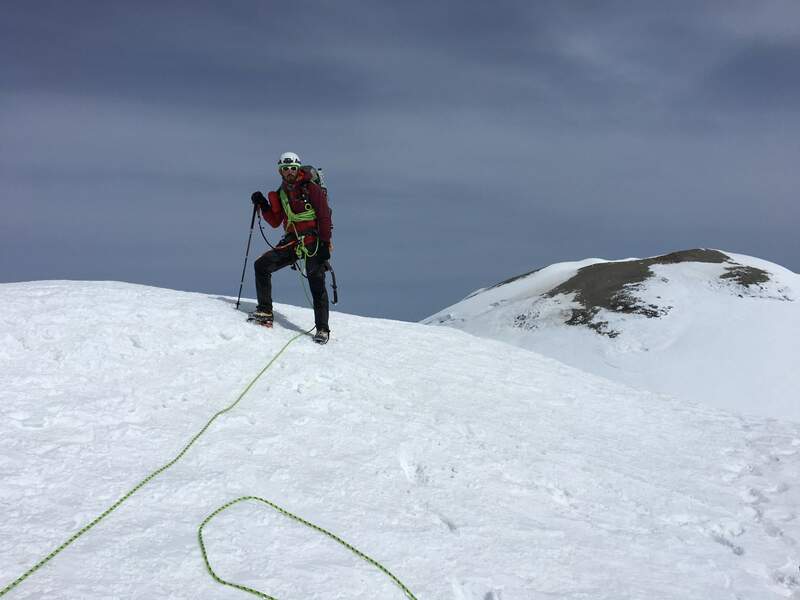 We soon finished the pitched out sections of ice and started simul-climbing on ice until we reached the snowfield from where we could see the bergschrund. At this point, we switched back into glacier travel mode and started moving our way up the Liberty Cap. This section of the climb is deceptively long and steep. Mike was spearheading the assault in this section by breaking trail. Soon, the angle of the slope started to drop and we had topped out the technical section of the climb with just 400 feet non-technical climbing to the top. 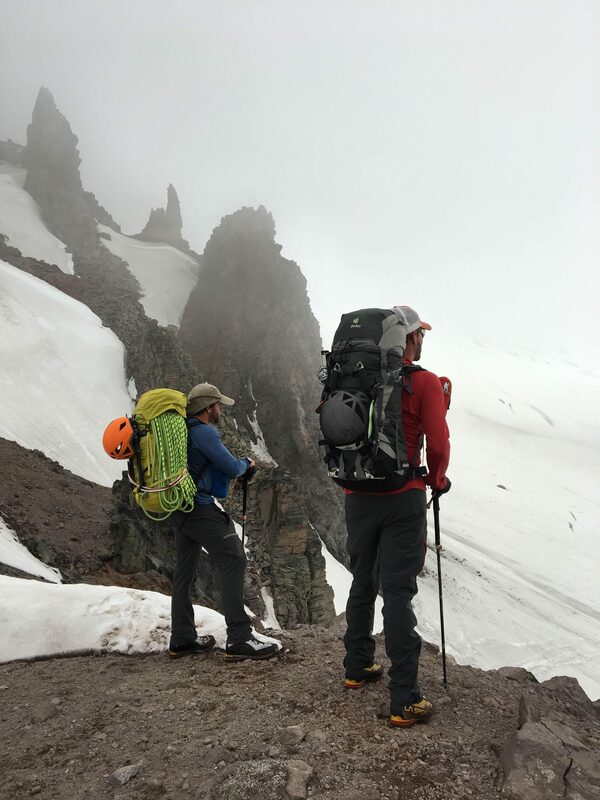 At Liberty Cap, we went through the regular summit photoshoot and then started to descend towards Columbia Crest. 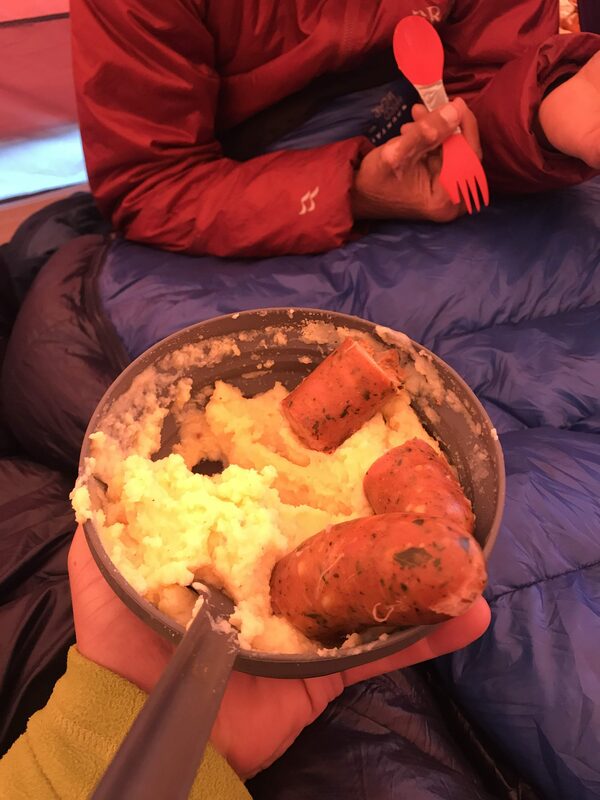 Thumb Rock camp at 10,466 ft and yes we have finally managed somewhat of an alpine start on summit day! On the firm neve, we go! 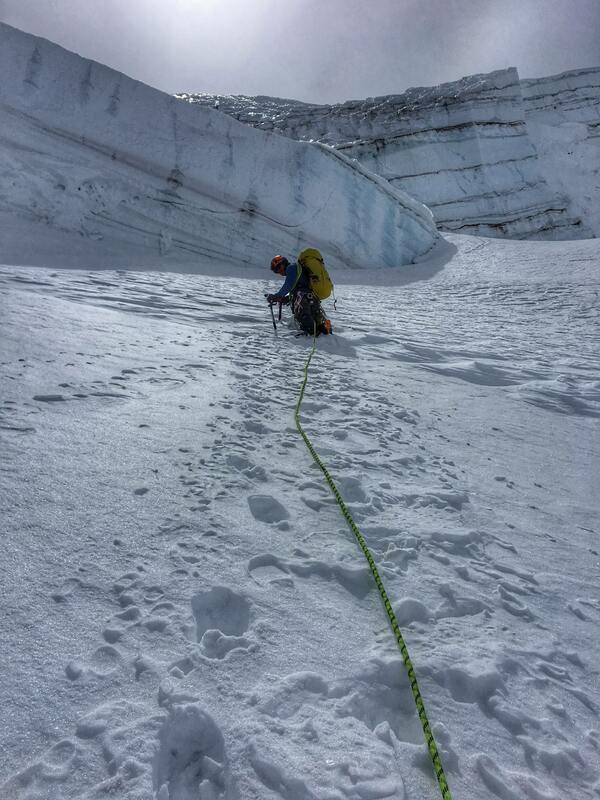 Me, leading one of the ice pitches. The ice quality up here was superb, with over 1000 ft of ice to climb. 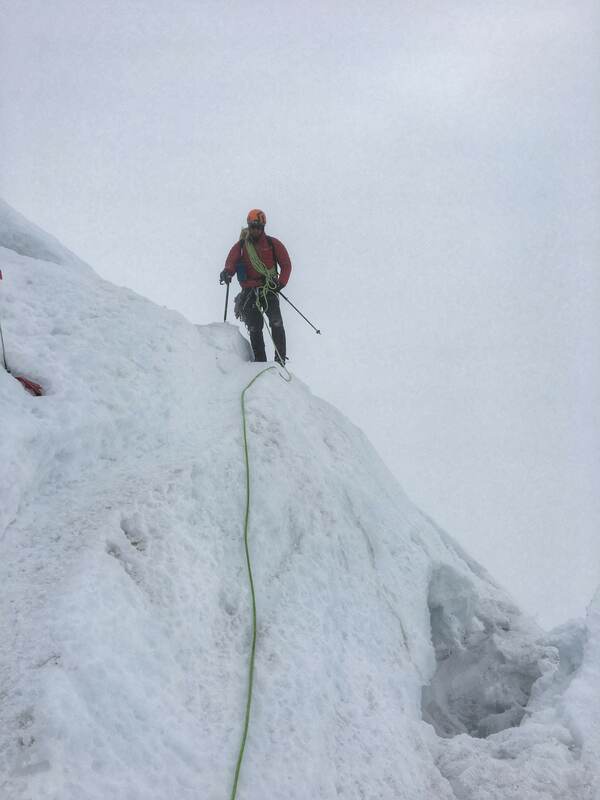 A beautiful yet precarious looking serac high up on the ridge. 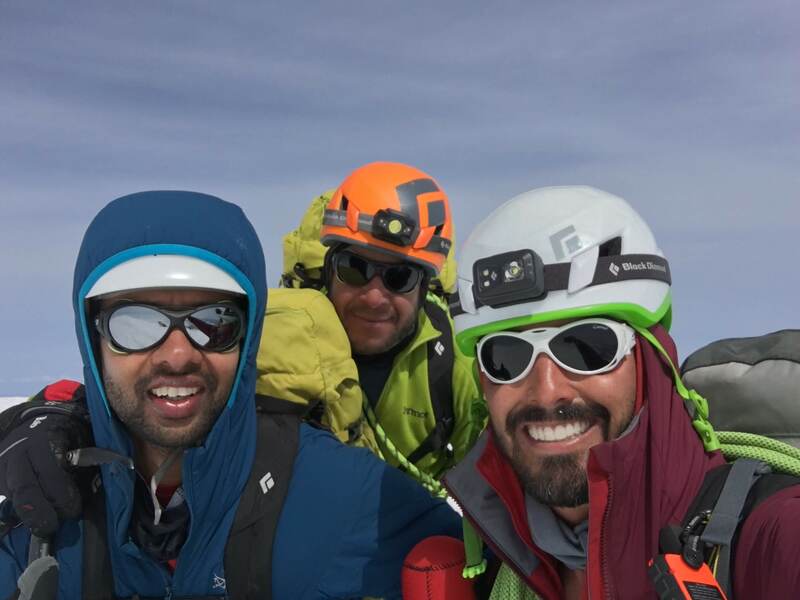 As we summited Liberty Cap, the narrow weather window began to close, leading first to 45-mile hours winds and then to windy whiteout conditions on the upper mountain. Instead of trying to find the Emmons/Winthrop descent, we decided to descend the well-marked and wanded DC route towards Paradise. 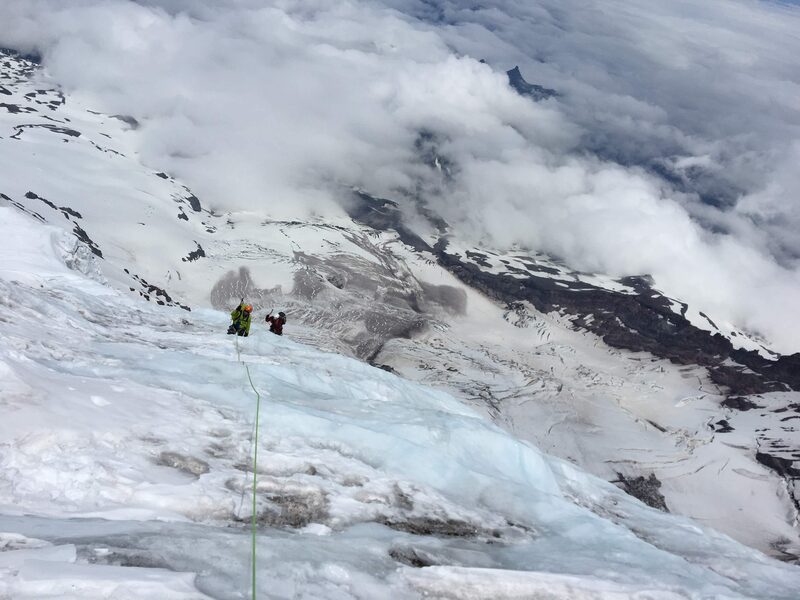 Thus, also summiting Columbia Crest and making a complete North to South traverse of Mt Rainier just like Ome Daiber, Will Borrow, and Arnold Campbell did during the first ascent of Liberty Ridge in 1935. But more importantly, we were all glad that we made it down safely! We got back down to Paradise safely and turned in our climbing permits. 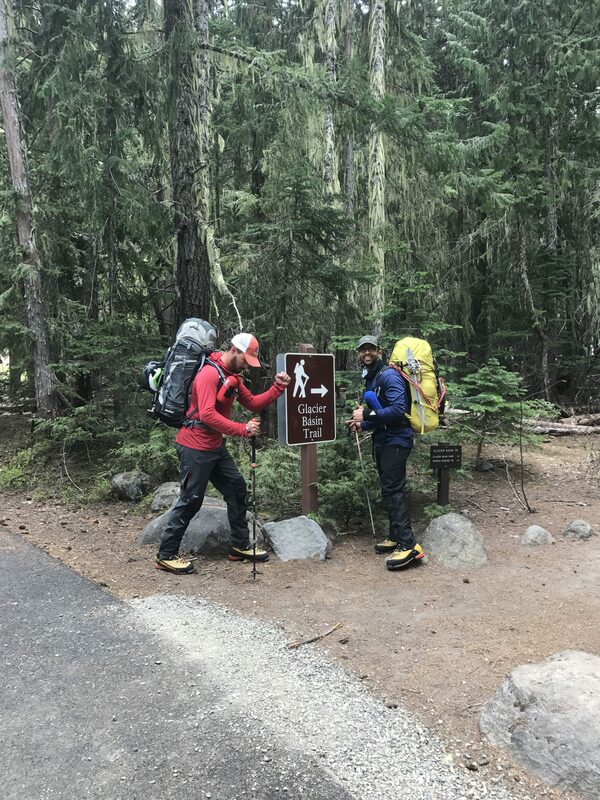 We were hoping to bum a ride with the rangers, or at the very worst, get an Uber ride into town and then figure out how to get to our car, but as it turns out Uber, cabs and such services are not allowed in National Parks. Thankfully we ran into Jeff Baker, who is a superintendent at Korsmo Construction, Inc. His company is working on the Paradise Inn reconstruction. 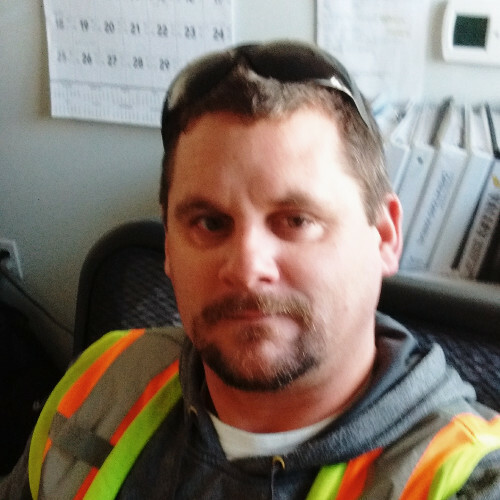 Jeff is certainly one of the nicest, selfless people you will ever meet! 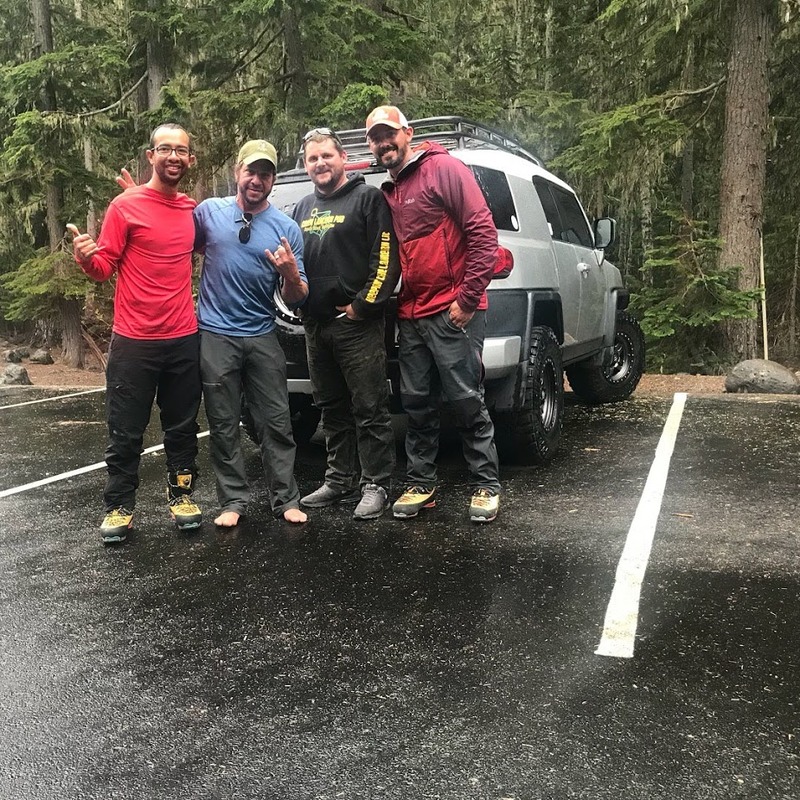 After hearing about our climb and traverse of Mt Rainier, he drove out of his way to give us a ride back to our car in White River. Wow! Awesome write-up and documentation! Very proud of you guys!